Back in June I went on holiday. I headed to Morocco for a week and as you can imagine it was scorching, averaging temperate was about 35 degrees, sometimes plus. As a result, I got a fabulous tan (using all natural sun protection of course!) What with my mixed ethnicity, I tan quite easily and develop quite a nice golden colour. I love being tanned, everything about it makes me feel better, and when it starts to disappear, I genuinely get quite sad. So I decided that I'd 'fake it til I make it' (to another holiday). 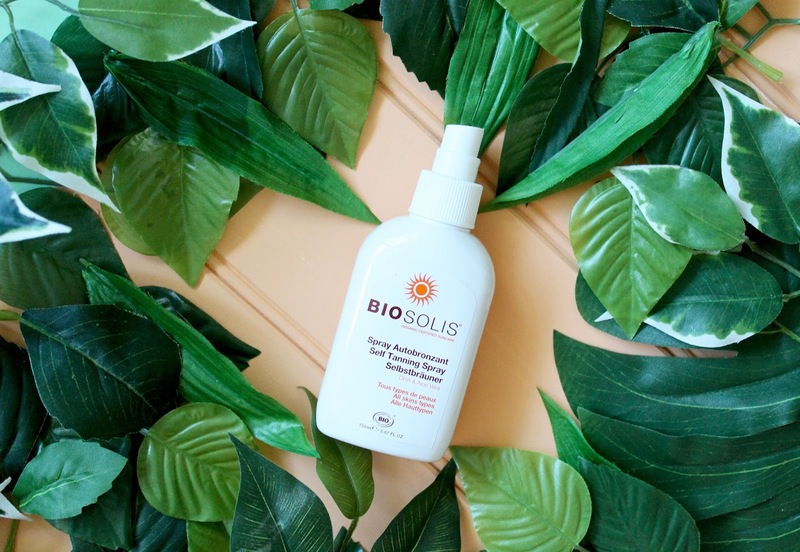 In the past I've dabbled in different natural tanning oils, creams and lotions, but by the the best one for me has been this Biosolis one. 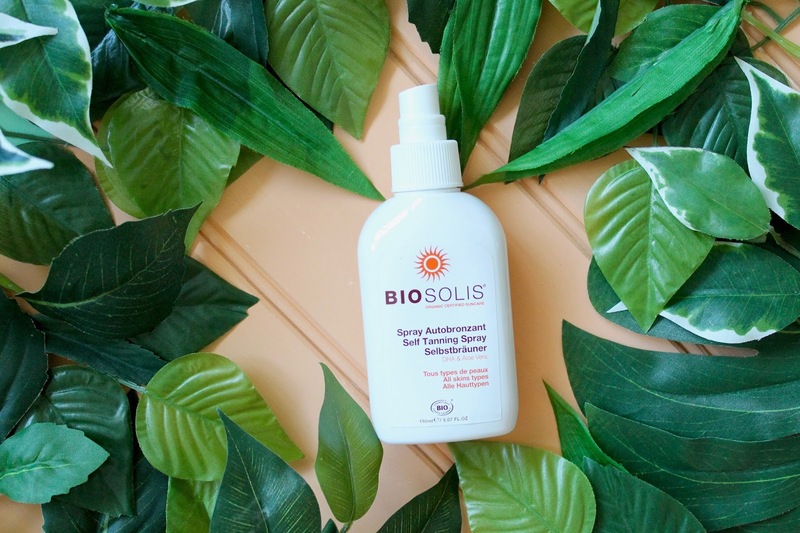 I got this Biosolis Self tanning Spray* through BigGreenSmile, the online natural products retailer. It's a new brand to their site and I had never heard of it before. After checking out the brand and seeing that suncare products and tan were their USP I thought I would be in good hands. After all I've had some disasters in the past. This tanning spray is ECOCERT certified, Cosmebio certified and FDA certified, 99% of the ingredients are from natural origin and 83% are from organic farming. The tanning factor of the formula is achieved with DHA (Dihydroxyacetone). So how good is it really? Well, last time I headed home I was chilling out with my mum and sister, trying on clothes and whatnot when my sister suddenly pointed at me and shouted 'Why are you so tan?!' I looked at my legs and they were indeed glowing gorgeously. I told her it was fake tan and she was genuinely surprised! Neither she nor my mum could get over how natural it looked in colour and how streak free it was. They both thought it was my real tan. That is how good it is on me. In fact they both insisted I send them the link, which I dutifully did, because they want to buy it too. The application is amazingly easy, the easiest I've ever tried. the formula is a milk and very thin and fluid. 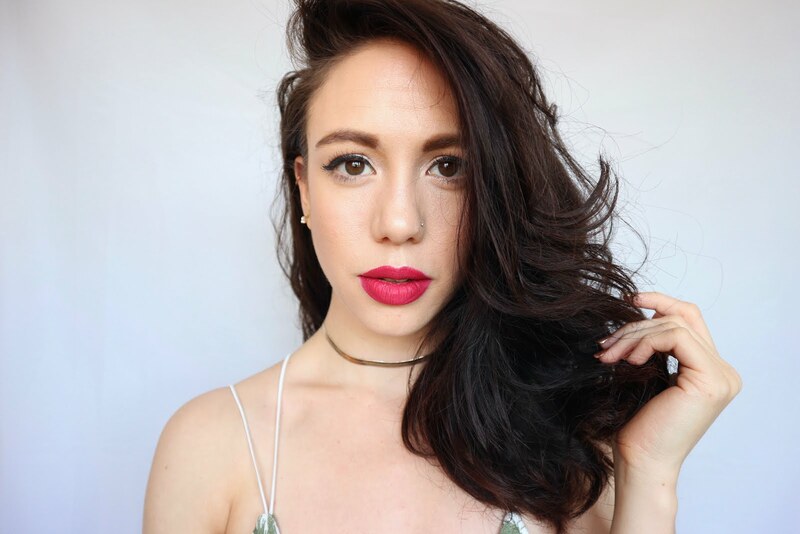 This makes it really easy to blend and control when you apply it to your skin. As it's not thick , it doesn't congeal or gather in nooks and crannies, it glides over your skin and sinks in fast but not so fast that you have to work like a mad man. The packaging comes with a spray which is a pretty decent spray but I actually found for me the easiest and fastest way to apply was to spray it directly into my hand and then apply to my body**. This way I know how many pumps each part of me received and required. Simple. I think the fluidity of the formula is why it is so amazingly streak free and even, no patches or overly dark marks. I can apply this to my whole body in a matter of minutes and be dry and able to sit down and head to bed etc within 10 mins of application. Also only once did it slightly mark my white sheets and that was after a super hot and muggy night. It washed out of my sheets without a problem too. The tan develops after three hours but after 24 hours it has intensified which is why I like to tan before bed so I wake with a glow and keep on glowing throughout the day. By the end of the day, I'm golden! On me this tan lasts about three days before it really fades so I apply about every three to four days. Like a traditional tan, after application the top layer as it were, does wash away a little but it helps reveal the true tan underneath. Unlike a traditional tan I don't really need to exfoliate before hand. Another effect of this tanning spray is super soft skin. The formula is blended with Aloe Vera, Avocado oil, Shea butter amongst other ingredients and by gosh do they make my skin feel smooth and soft and very supple! It also includes beeswax so may not be suitable for vegans. For me this tanning spray is a total winner and when it runs out I will definitely by purchasing it - It's £12.99 for 150ml from BGS. **Just a note, as I said I apply this with my bare hand and have never tried it with a tanning mitt. I can't imagine a mitt making things easier, actually I reckon it would make things harder and more fumbly. I don't know.